Average mortgage rates had a better day yesterday. As we predicted, they hardly moved. In the end, they were down, but only by the smallest measurable amount. Your lender may well have not bothered to amend its rates sheet. This morning’s publication of the monthly employment situation report was one of the most important events on the April economic calendar. However, the figures it contained were mixed, with jobs numbers good but wage growth cooling, and they seem to have left markets unmoved. So the data below the rate table are similar to yesterday’s: indicative of mortgage rates holding steady today, or possibly just inching either side of the neutral line. However, regular readers will know these morning snapshots are intended as helpful guides rather than bullet-proof forecasts. 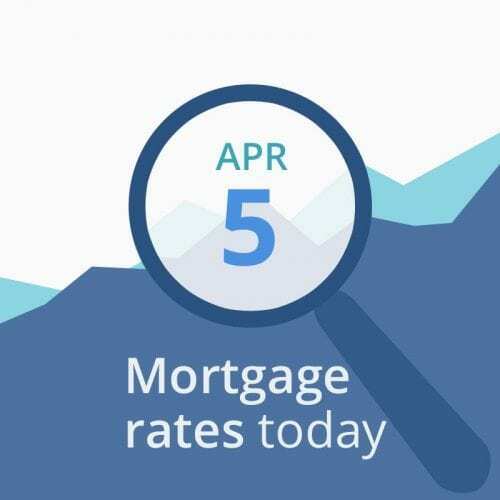 Unless things change, mortgage rates could be in for a similar day today as yesterday. Even though this week’s rises have been significant, they don’t yet constitute a trend. Those are impossible to discern from just a few days’ changes. Frustrating though it is, there really is no way of knowing immediately what movements over a brief period mean in the wider context. Of course, it’s possible the Federal Reserve’s last big statement has established a long-term downward trend. But you can still expect to see rises (such as those earlier this week) and falls within it as other risk factors emerge and recede. And, depending on how near you are to your closing date, you may not have time to ride out any increases. You may have read about the recent (though no longer current) inversion of the bond yield curve. And you may understandably have chosen to skip over that bit. But the jargon hides a simple phenomenon: Yields on short-term U.S. Treasury bonds were higher than those for long-term ones. And that’s highly unusual. Normally, you get a higher return the longer you’re locked into an investment. Of course, a recession couldn’t, by definition, arise before you close. But the more investors suspect there’s one on the horizon, the lower mortgage rates are likely to go. And, amid mounting evidence of an economc slowdown, concerns are real. Brexit is Britain’s leaving of the European Union (EU). It was first due to leave last Friday but managed to negotiate a last-minute extension to April 12. On Wednesday, the House of Commons (the parliamentary chamber closest to our House of Representatives) passed by one vote a bill to force the administration to seek a further, longer extension and to prevent a no-deal Brexit. “No deal” would see the country crash out of the EU without any agreement. Nearly all economists and most businesspeople think that would be a monumental folly that would cause immeasurable economic self-harm. Wednesday’s bill isn’t yet law. It still has to win a majority in the House of Lords, which you could think of as a bit like our Senate, though it’s actually quite different. That majority is likely to already exist but it’s almost inevitable that opponents will do their best to block the legislation using procedural devices. Indeed, those tactics worked yesterday and thwarted attempts to rush through the bill in hours. Still, there’s a real probability it will be enacted on Monday. The most likely (but far from certain) scenario now is that the British Prime Minister will request a much longer extension — maybe a year — during which the UK can negotiate a new withdrawal agreement — or hold a second referendum or a general election to break the political deadlock. If British politicians eventually find a sensible way forward, that would be good news for the global economy and might see mortgage rates rise. However, if Parliament fails to enact the current legislation and the country crashes out of the EU with no deal in a week’s time, mortgage rates could dip even further. Meanwhile, markets are increasingly focused on current U.S.-China trade talks. Following a visit to Beijing by an American team last week, a high-level Chinese delegation arrived in Washington D.C. on Wednesday to try to make progress toward an agreement. The two sides remain apart on two key issues — the fate of existing U.S. levies on Chinese goods, which Beijing wants to see removed, and the terms of an enforcement mechanism demanded by Washington to ensure that China abides by the deal. Yesterday, President Trump warned it might take four or more weeks to finalize the agreement, while hailing it as potentially “epic.” Certainly, both sides badly need a good outcome, and for similar reasons: First, to burnish political prestige domestically by bringing home a win. And secondly, to step back from economic slowdowns. The last big Fed announcement, which was doveish and ruled out further rate hikes this year, will likely add some downward pressure on mortgage rates in coming months. As we’ve seen in recent days, that doesn’t mean there aren’t other risks (currently known and unknown) that could see them rise, possibly sharply. And those recent rises create new grounds for caution. So we yesterday changed our advice. We now suggest that you lock if you’re less than 45 days from closing. Of course, financially conservative borrowers might want to lock immediately, regardless of when they’re due to close. On the other hand, risk takers might prefer to bide their time. It’s been another busy week for economic reports. But none has been as important as today’s official employment situation report. The key figures that emerged this morning showed more new jobs than had been forecast and an unemployment rate that held steady, as expected. Those are both good news. However, average hourly earnings barely moved: up 0.1 percent against forecasts of +0.3 percent. And that’s disappointing. Markets tend to price in analysts’ consensus forecasts (we use those reported by MarketWatch or Bain) in advance of the publication of reports. So it’s usually the difference between the actual reported numbers and the forecast that has the greatest effect. That means even an extreme difference between actuals for the previous reporting period and this one can have little immediate impact, providing that difference is expected and has been factored in ahead. Although there are exceptions, you can usually expect downward pressure on mortgage rates from worse-than-expected figures and upward on better ones.